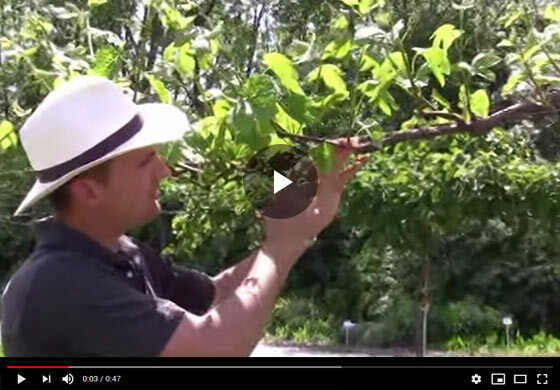 Felix, a horticulture expert from Gurney's Seed and Nursery shows off the post pruning growth on grape vines and discusses the right time of applying fungicides to your grape vines. Hi, Felix here with Gurney's, and today I want to talk to you about post pruning what growth we have on some mature grapes we've trellised into a single curtain and for those of you that looked at the pruning video that we showed during the dormant season - late winter season, this is the same vine and you can see our where our pruning cuts were, here on these stems, we've left three bugs or two buds depending on the case, and you can see our extension growth now from those buds we left is a nice twelve to fourteen inches of growth. And on those extension growth, we have our flower clusters here, they have yet to open and if the camera will show that, you can see they're in tight bud have some nice cluster formation in our shoots. The reason this is important is that right now is a great time to get some fungicide sprays on. First period is right when those buds break is to get some copper-sulphar sprays on and right now is a great time right before those flowers open and then again after the flower period is over. So I thought this would help you identify what your flower clusters look like, what they are, what they look like right before they open and we will show you in some other videos during flowering season, and also when you have your berry set. Thanks for joining us here at Gurney's. Look for other videos to help you with your growing, your success with your grapes.